On December 3, 1865 school commenced for the area. The school was officially known as School District # 6, Township 42, Range Line 11. It was known as Pate School, the Little Red Brick School House and ultimately Wheeling Center School District 23 at the turn of the century. In 1936 real estate developers, Smith and Dawson, constructed homes in the area bounded by Willow Road on the north, McDonald Road on the south, Elmhurst Road on the east, and Schoenbeck Road on the west. In June of 1938 WPA funds were secured to pay for half the cost of two-room schoolhouse, which is now known as the Grodsky Administration building. It contained two classrooms for 70 students and a large basement that was eventually used for classroom space, a cafeteria as well as housing the first library. The formation of the local PTA unit was on Nov. 10, 1939. The charter contained the names of 101 individuals. Their stated purpose was to “better the educational facilities and curriculum within the District.” In the early 40's their focus was on establishing a hot lunch program and a library. In April of 1942, 1 cook and 10 mothers served the first hot lunch to 56 students for 10 cents a day. During the "war years" the association supported all phases of war work in the community. 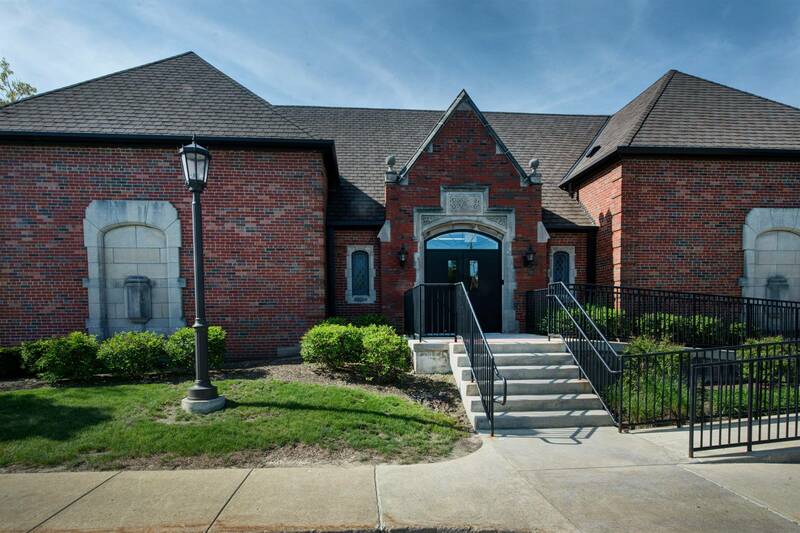 The first library was also established by the PTA in 1939 within the schools and served the schools through 1954 when the school district took over the program. The building program was halted because of World War II. By 1944 the enrollment had grown to 127 students and another classroom was added to the original grade school. In 1945 the first eighth grade class graduated sixteen students. In August of 1947 the school district housed the first kindergarten and in 1949 the vocal instrumental music programs began. Also in 1949 the first student newspaper, The Scholar was published. During the next twelve years, Smith and Dawson developed most of the area bounded by Euclid Avenue north to Palatine Road and Wheeling Road west to Schoenbeck Road. Elmhurst Road served as a dividing line running north and south. The center of the community became the intersection of Elmhurst and McDonald Roads. It was there that one of the first shopping centers in the state was constructed. In the 1950s, land north of Palatine Road was developed. The main subdivisions were Country Gardens, Drake Terrace, and Bluett. Characteristic of the original development of Smith and Dawson, the homes were built on large lots with half an acre being the most common. A significant trend in home construction began in the late 1950s and early l960s. Developers built on smaller lots, and new residents sought annexation to nearby municipalities. Arlington Vista, Tallyrand, Dunroven, and Sugarbrook subdivisions were built to the west between Schoenbeck Road and Buffalo Grove Road. However, all of the subdivisions were incorporated into the Village of Arlington Heights. This enrollment influx resulted in the addition of 4 rooms, a gymnasium and kindergarten classrooms at the North campus in 1953. In 1956, a second building of ten classrooms was added to the campus site south of North School. This school was called South School. By 1960 a junior high building known as West School was built to accommodate the growing population. The original wing, composed of six classrooms, offices, gymnasium and stage was ready for occupancy in September of 1960. The building would go through four more additions before it reached its current size in 1997. By the 1964 name changes occurred on the campus. West School became MacArthur Junior High School, North School became Anne Sullivan and South School became Betsy Ross. John Muir School, located at Oak Terrace on the north end of Prospect Heights, opened in the fall of 1967, representing a new approach to school construction. It was an all-electric building with three main pods serving as learning areas. Eisenhower School opened in 1969, representing the second elementary school built away from the original campus site. Eisenhower School was built with funds from the Illinois Building Commission. Subsequently, because of the maturation of the community and declining birth rates, the district enrollment began to decline and Muir school was closed in 1981. The building was subsequently rented by N.S.S.E.O. and later sold to a day care facility in 1987. In the 1970s, development continued with homes constructed in the Northgate subdivision in the northwest corner of the district bounded by Hintz Road on the north, Buffalo Grove Road on the west, and Waterman on the east. This area in Arlington Heights grew and included the V.I.P. Apartments and Lake of the Winds Condominiums just south of Hintz Road and east of Waterman. The Candlewood Apartments were constructed in Arlington Heights on the corner of Rand, Windsor, and Camp McDonald Roads. Additional construction was completed in Prospect Heights with the building of Brandenberry Apartments on Camp McDonald Road on the south, Waterman on the west, Olive on the north, and Dale on the east. In the south portion of the District located in Mt. Prospect, Colony, Country and Wimbleton Condominiums were developed. Also, an area in the Village of Wheeling bounded by Hintz Road on the north, Sherwood on the west, Elmhurst on the east, and Garden Lane on the South was developed with single-family homes. The Forum Apartments and condominiums located north of Palatine Road and east of Elmhurst were constructed. In the 1980s, single-family homes were constructed in the Kingsport and Ridgefield subdivisions located in the Village of Wheeling, along with the single family and carriage homes of Polo Run and the Winetree Apartments. In Arlington Heights, north of Willow Road and east of Waterman, the Courts of Russetwood were developed with single-family homes. Just west of there carriage homes were constructed in the development called Arlington on the Ponds. The Hoffman Builders completed the Northgate subdivision by building homes in the far northwest corner of the district off of Hintz and Windsor Drive. Several builders developed A one hundred and forty acre site across from the MacArthur Middle School. Called Lake Arlington Towne, it includes single-family homes, townhomes, and apartments. Prospect Heights has single family homes constructed in the developments called Summerset Estates, located north of Palatine Road and east of Schoenbeck Roads, and Willow Estates is located south of Willow Road and west of Waterman. During the late 1980's and early 1990's, additions were added to Sullivan School and Ross Schools. In 1991 a joint venture was entered into with the Arlington Heights Park District and a large gymnasium was completed at the Ross School site. In 1997 major renovations and additions took place within the District, adding additional rooms and modern improvements to the buildings. With the start of the 2011-12 school year District 23 reorganized its three elementary schools Dwight D. Eisenhower, Betsy Ross, and Anne Sullivan into grade level centers. This meant that all students attended a school based on their grade level. Eisenhower School enrolls Early Childhood children, Kindergarten and First Grade students. Ross School enrolls Second and Third Grade students, and Sullivan School enrolls Fourth and Fifth Grade students. All district Sixth, Seventh and Eight graders attend Gen. Douglas MacArthur Middle School. In the summer of 2013, School District 23 embarked on a three-year plan to convert all of the District schools to geothermal heating and cooling systems. During this process the lighting and flooring were also upgraded to reflect green energy standards and to once again update the facilities. 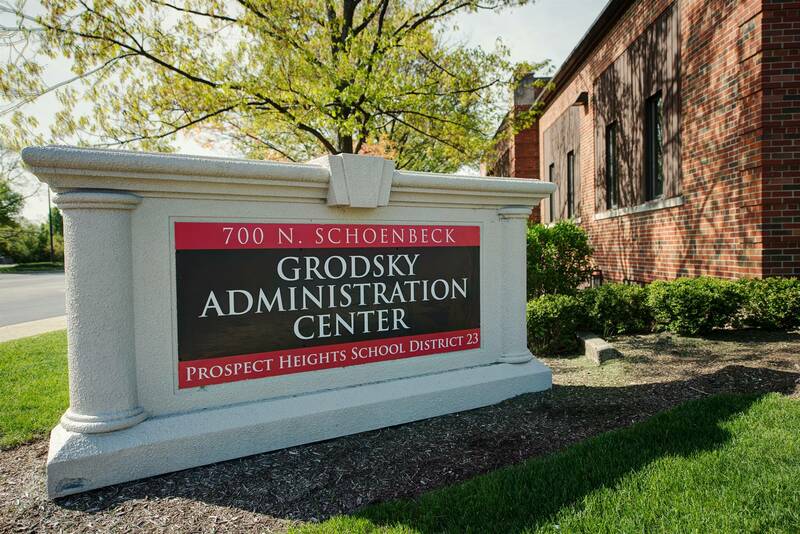 The residents of District 23 have always placed a premium on good schools. Locally, elementary District 23 and high school District 214 meet the educational needs of the children. The community is fortunate to have two high schools, Wheeling High School and John Hersey High School, built within its boundaries. Although much of a school district's history can be found in its building program, it's the through the people who operated the schools and the activities of the teachers and students who use the buildings that the full history is uncovered. The teaching staff, administrators and school board has been instrumental introducing new programs to the school's curriculum. The Parent Teacher Organizations, the Prospect Heights Instrumental League and other school organizations over the years have added to the success of District 23. Although the school district is the smallest in the immediate area, viewed in retrospect its development has been significant.